Pillsbury House Theatre's production of the new play Buzzer (by playwright Tracey Scott Wilson) is a very modern play about race, class, gender, relationships, and gentrification of neighborhoods. Three characters, an interracial couple and their recovering addict friend, struggle to find their way in this seemingly "post-racial" world. Jackson is a successful lawyer who grew up poor in a neighborhood filled with drugs and violence, and was able to get himself out and make a better life for himself. He rents (to own) a newly remodeled apartment in his old neighborhood, which is transitioning from a "bad neighborhood" to one with coffee shops and lofts and restaurants. He and his girlfriend Suzy, a teacher in the inner-city schools, move in. Jackson convinces Suzy to let his down-on-his-luck best friend Don move in with them, despite her reluctance. Don is from a privileged background, and despite constantly getting himself into trouble, has been able to get out of it thanks to his rich and powerful father. Jackson was given nothing and worked hard to achieve the life he wanted, while Don squandered every opportunity he had. But somehow the two men remained friends. Their friendship is tested when Suzy tells Don that she's being harassed on the street, and they grow closer. Each member of the trio has their own plan to end the harassment. Suzy thinks that if she stays strong and ignores the bullies, they'll eventually stop. Jackson wants to threaten them with violence, while Don thinks reasoning with them and being friendly will solve the problem. The conflict grows inside the apartment and outside on the street. The three-person cast is fantastic in bringing these characters to life, and making them all at times sympathetic and at times maddening. Sara Richardson, who was fabulous as Fraulein Sally Bowles in Cabaret last year, is equally good here playing this completely different and much more real character. Namir Smallwood (the exiled prince in Ten Thousand Things' Life's a Dream) plays her boyfriend Jackson with great intensity, and possesses a powerful angry stare (as was pointed out in the post-show discussion), which he wears as a weapon. Hugh Kennedy (my favorite Hamlet) is the third wheel, Don, and plays him with a restless frenetic energy that's appropriate for an addict trying not to go back to his old ways (a little like David Arquette on a talk show, all fidgety nervousness). The play is written in such a way that the scenes almost overlap. One scene has barely ended when the next scene picks up immediately, which I found interesting and a great way to keep the momentum building. In the audience the night I attended was a group of high school students. It was really fun to watch them watch the play. They were so present, so in the moment, so reactive to what was happening on stage. I love theater, but perhaps a bit of the magic and wonder wears off when you see as much theater as I do. But for these kids it was all still there. It was refreshing to see. They also had some interesting comments at the post-show discussion. I love post-show discussions at Pillsbury because they always bring in someone from a community group that is working on some of the issues explored in the play. With this piece it's the City of Lakes Community Land Trust, which "provides and fosters stewardship of perpetually affordable homeownership opportunities for low-income and moderate-income families and individuals." It felt like a great community discussion, thoughtfully led by Artistic Associate and actor Kurt Kwan, rather than just a Q&A session with the actors. There were comments from people who live in the neighborhood in which the theater resides (35th and Chicago), and someone who was a victim of gang violence, as well as the aforementioned students. Theater is at it's best when it engages the audience in a conversation about very real issues facing people today, or at least gets you thinking about things in a different way. That's something Pillsbury House Theatre does very well. 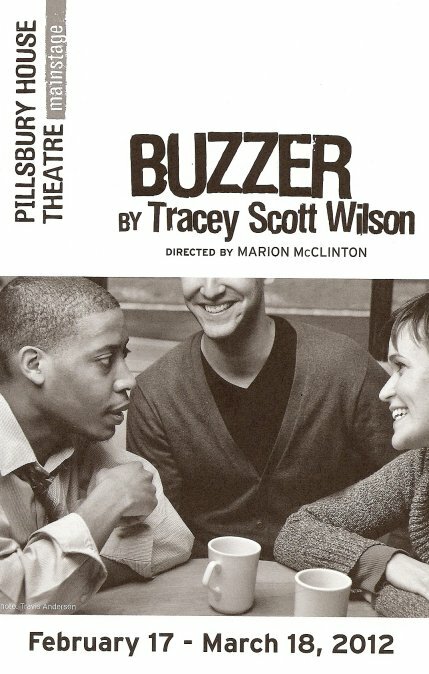 Buzzer is playing now through March 18, and all seats are "pay what you can," from $5 to $50, which is a pretty cool thing when theater tickets for the big touring productions go for $100. You'll definitely get your money's worth and more, no matter what you pay!